This is one of those recipes that feels fancy, but only takes about 5 minutes to make. You'll want to have everything at the ready before you start. See Notes after the recipe for some guidance and safety tips for flambe-ing (with an alternative), and other details. Classic Bananas Foster, made in the Adventure Kitchen. Warm caramelized bananas and vanilla ice cream, topped with rum flambe sauce. 1. Peel the bananas and cut them in half lengthwise, then in half horizontally, so that each banana is now in 4 pieces. 2. Melt the butter in a wide skillet over medium heat. Stir in the sugar, cinnamon and salt to combine well. 3. Lay the banana pieces in the pan over the butter/sugar mixture, cut side down. They should sizzle a little as they hit the pan. Let them cook, undisturbed, for about a minute, until they've caramelized on the first side. Carefully turn them over in the pan to caramelize the second side, for about a minute longer. 4. Transfer the banana pieces to two plates. Remove the pan from heat and quickly pour in the rum and liqueur. Use a long-handled lighter or match to carefully light the alcohol on fire in the pan. (PLEASE read the notes at the bottom for tips on doing this safely!) Carefully swirl the sauce around the pan gently until the flames subside (about 1 minute). 5. Quickly top each plate of bananas with a scoop of ice cream, then pour half the sauce over each plate. Serve immediately. This is a classic New Orleans recipe, complete with flambe! So you'll either feel really fancy or really nervous (or both) when you make it. PLEASE tie long hair back and don't wear any flouncy sleeves when you make this. And use a long-handled lighter or long matches if at all possible. If you're new to flambe, here's the situation: alcohol vapors are flammable, and the heat causes them to rise along with the steam. So hold the match or lighter above the surface of the sauce, and when the flame connects with the vapors, the vapors will ignite - all at once. You'll suddenly be standing there with an entire pan full of flames. The flames subside in about a minute or less, but still. 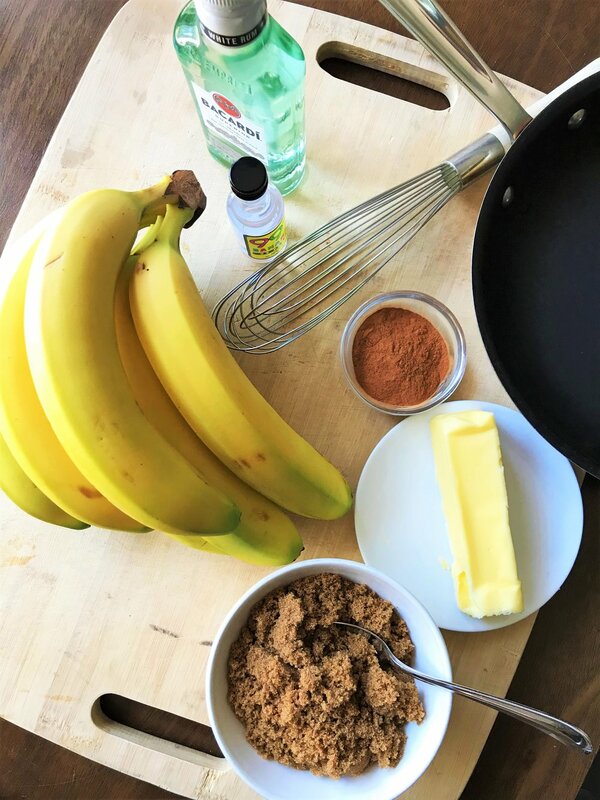 In Step 4, after you've removed the bananas from the pan, turn the heat to medium low and pour in the liquors, along with a splash (about 1.5 teaspoons) of water. Use a wooden spatula to scrape the bottom of the pan while the liquor bubbles, for about 30 seconds to a minute, until the sauce has thickened slightly and the raw alcohol smell has subsided. As soon as it's ready, pour it over each serving. Choose bananas that are not too ripe for this dish. They'll hold together better.